The Instrument installation is an outcome of cross regional dialogue on an exciting mission: how to integrate architectural making and instrument making crafts through a pavilion predominantly made out of Bamboo. When it comes to bamboo, the Borneo landscape is blessed with its diverse palette of this material: namely Auru, Tering for construction use, Bru for musical instruments, and Abu for cooking. It is rare to see bamboo being applied as a construction material, since it is rivalled by the equally abundant timber. For music, however, Bornean sounds are inspired by the region’s surrounding nature. If we look back at its origin, Bornean musicians used to play in the dark, when the jungle was at its loudest. With the goal of creating a symphony with nature, Bornean musical instruments are designed to mimic the sounds of nature with rhythm. Over the design development, UK ARB/RIBA qualified architect Wendy Teo travelled to the bamboo crafts capital Chiang Mai to work with specialists in bamboo. With a workshop theme ‘Harmonies of Nature’ in Chiang Mai University, they explored the potential of bamboo in sound with 40 students around the region (HK, China, Thailand, and Malaysia). This exploration is furthered with Indonesian site specific musician group Karinding Attack coming on board with their musical instruments embedded in the pavilion. What happens when a metal band wakes up one morning with an irresistible urge to go wild on traditional Indonesian musical instruments? 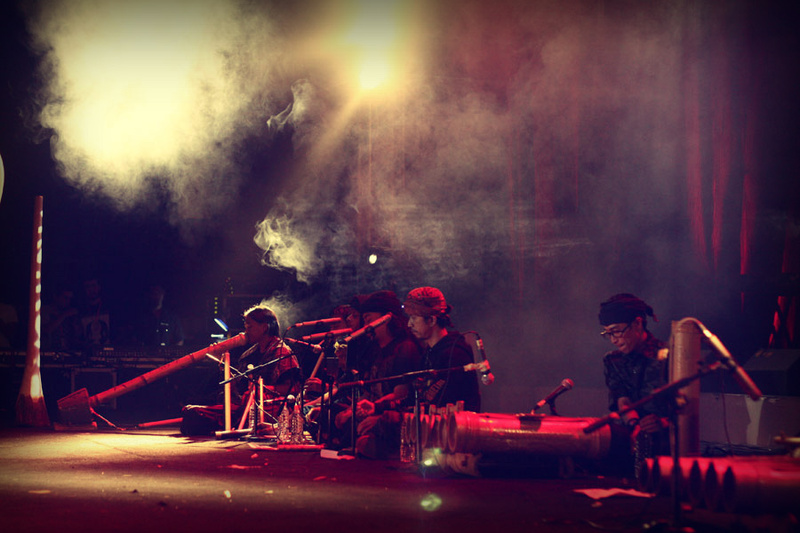 Indonesian band Karinding Attack was born in 2009, under the spell of the karinding, a bamboo mouth harp. The band learned to play all sorts of bamboo instruments (such as flutes, xylophones, weird percussion…) and added a hefty portion of metal and punk elements to the mix. They were an immediate success in Indonesia and were quickly discovered by fans abroad eager for something new. Karinding Attack will perform within the bamboo musical installation, creating a mystic and sensational sound experience.